Bosc Pears are in season and a perfect pick. We’re fans of pears because of their great flavor, versatility in recipes and their nutritional profile. US-grown pears from Oregon and Washington are a healthy addition to any diet. A medium pear has six grams fiber, making it one of the most fiber-rich fruit choices you can make. That means they help fill you up, not out! Pears are also a good source of vitamin C – and has only 100 calories. They’re also naturally sodium and fat free. Be sure to enter to win 7 pounds of fresh US-grown pears in our gift basket giveaway. And in case you haven’t noticed, Bosc pears are overly abundant right now so they’re a great bargain at your supermarket or farmer’s market. Bosc are the preferred pear variety when it comes to cooking. Bosc With its elegant shape, cinnamon-brown skin, crisp texture, and honey-sweet flavor, this special pear variety is one that’s great for both sweet or savory dishes. Like all pear varieties, Bosc pears ripen after being picked. This means that Bosc pears may be available at your local grocer in a firm, under-ripe state. For those that prefer a crisper piece of fruit, this is the pear for you. The Bosc has a honey-sweet flavor even when it’s under-ripe. 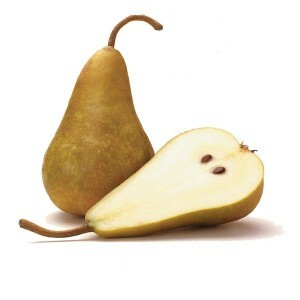 So, go ahead and chomp away on that firm Bosc pear, and enjoy its sweet crunch. If you prefer a juicier pear, then simply “Check the Neck for Ripeness” as USA Pear growers advise. Press the “neck,” or stem end, of the Bosc, and if it yields to gentle pressure, then it’s ripe, sweet, and juicy. If the pear feels firm, then just leave it at room temperature to ripen, and “Check the Neck” daily. Only refrigerate your pears if you want to slow ripening. Bosc pears are firmer than other varieties so they hold their shape, flavor and texture in high heat applications. It’s slow to give off its juice when baked, so your pear pie or cake won’t succumb to sogginess. Also, some recipes call for pears to be ‘firm, yet ripe.’ The Bosc pear is one that meets this requirement handily at any stage of ripeness. Fresh Bosc pears can also add a crisp sweetness to a salad. 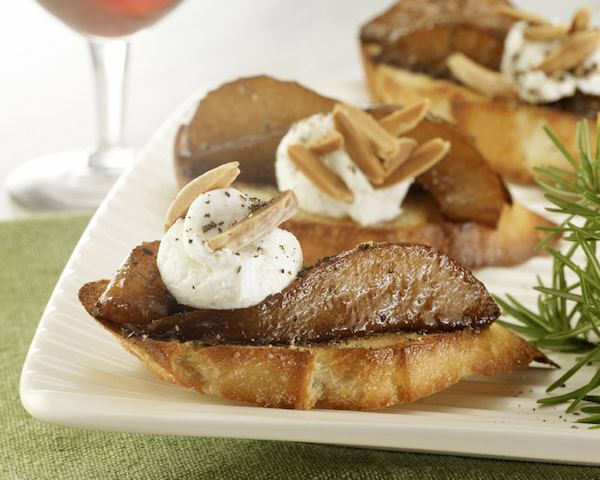 A new favorite recipe for pear lovers, this appetizer is incredibly delicious…and can be prepared in a snap! The balsamic glaze is the perfect complement to the sweet pear and salty goat cheese. 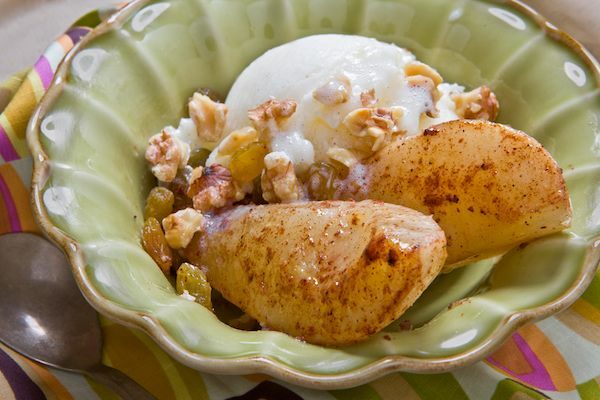 This simple, tasty pear recipe can serve as breakfast with nonfat vanilla yogurt, or as dessert with nonfat Greek yogurt or a nonfat froyo. To prepare pears, melt butter in a large skillet over medium heat. Stir in spices and cook for 30 seconds or until aromatic. Add pears and cook for 15 minutes or until tender, stirring frequently. Stir in lemon juice. Serve with nonfat Greek yogurt or a low-fat froyo.